It is not a secret that rich and famous like to have fun with illegal drugs from time to time, but when they get publicly exposed, that creates big news. Here are some unforgettable stories about A-list celebrities that got caught with prohibited substances. For one reason or another, we are all obsessed with lives of big-time actors, musicians and other famous people. The interest peaks whenever such a person gets into legal trouble, as the public enjoys nothing more than dragging its formerly beloved heroes through the mud. Alas, celebrities are often inclined to indulge the masses, getting into silly situations that typically end in a well-publicized humiliation. On point, the number of celebrities caught with drugs throughout recent history is staggeringly high. Some of the incidents are widely known, while others barely moved the needle of media reports and the culprits maintained their reputations almost intact. One way or the other, these stories are still captivating to read and might even elicit a chuckle – after all, nobody can expect you to cry crocodile tears for people who mostly suffered from their own arrogance and mindlessness. Few people can cause scandals wherever they go at a rate that matches the heiress of the Hilton hotel chain, but her arrest for cocaine possession in Las Vegas was definitely one of the most salacious media moments of the last decade. The socialite and her boyfriend were found with a small amount of Colombian powder in their car after a routine traffic stop. Officers felt a strong odour of marijuana, searched the vehicle and took the pair to a police station for booking, to the delight of the nearby passengers who quickly gathered at the scene. In her trademark style, Paris claimed that the bag containing cocaine obviously isn’t hers ‘because it’s a cheap brand’, though the authorities didn’t buy it. Of course, this was not the only time miss Hilton came afoul of the law – she was arrested earlier that summer at the World Cup in South Africa for marijuana possession, as well. Paris was able to avoid prison time after the Las Vegas incident, but the resulting bad publicity did bring about some negative consequences for her business interests, including a cancelled trip to several Asian countries. Popular rapper won’t have to worry about his street rep ever again being convicted for possession of drugs and weapons. His most infamous arrest happened in Arizona when his tour bus was stopped and searched, turning up a collection of illegal goodies that would put any pusher to shame. The contraband found in his possession was quite diverse, including more than an ounce of coke, more than 40 grams of ecstasy, as well as over one hundred grams of weed for good measure. He also had a gun (legally registered in a wrong state) and some $22.000 in cash when he was apprehended by the authorities. The resulting trial was a huge sensation, but the vocalist got off relatively easy with a 36-month probation. 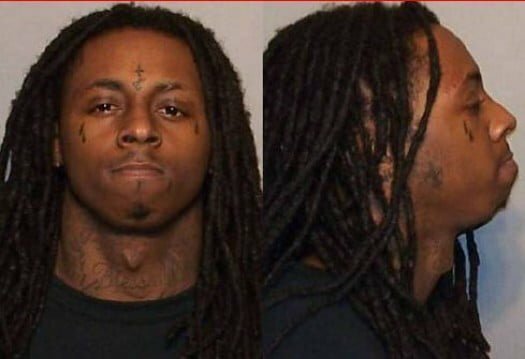 However, he went to jail anyway in 2010 on unrelated gun charges, and his music career took a significant step back while he served his debt to society. At the very least, you have to admit that he took his ‘gangsta’ image seriously. As one of the most influential guitarists of all times, Hendrix was a hero of the counter cultural movement, and his music was often associated with drug use. It is less known that a drug bust at the Toronto airport almost interrupted his stardom for good and could have sent him to jail for a long time. When the musician arrived in Canada to perform at a concert, he was found in possession of small quantities of hashish and heroin. According to the laws in force at the time, he was looking at a 20 years sentence if convicted. Hendrix claimed that he was unaware of the presence of drugs in his luggage, proposing that the bag with the narcotics was given to him by fans. Notably, he denied to be a heroin user and supported his claim by an absence of any track marks on his arms. He was eventually cleared of all charges but died under suspicious circumstances a year later. Back in the mid-90’s, the uber-talented wide receiver enjoyed almost divine status in Texas, having played a central role on multiple Superbowl-winning Dallas Cowboys teams. However, a single incident was sufficient to shatter his reputation and taint his name in the sports circles to this day. Irvin was partying with his crew at a fancy hotel when the police were called to investigate the extensive noise coming from his room. The officers saw a wild scene fueled by lots of cannabis and cocaine, with several semi-dressed people inside, including two young women and the football star. One of the girls took responsibility for all drugs found in the room, but the media roasted Irvin who was previously seen as the golden boy and a role model to local youth. He had further legal problems after he retired from playing professionally, but eventually recovered his image enough to be elected to the Hall of Fame. The Beatles basically invented the whole rockstar phenomenon, and that apparently included high-profile drug busts as well. Leading singer Paul McCartney was repeatedly arrested for marijuana, although he always managed to get away without real consequences – he paid just a minor fine when he was caught growing cannabis on a farm in his native Scotland. Probably the most infamous instance happened in Tokyo in 1980, when around 200 grams of weed was found in his bag on arrival to Japan. The singer spent ten days in jail, before being eventually kicked out of the country without any criminal charges. It’s fair to say that his worldwide fame might have played a role in his lucky run, but the ageing global icon continued to smoke and publically advocate for legalisation for several more decades without too much concern for legal prohibition.